"Build it and they will come" are certainly words that hold no truth in the startup world. When I first had the idea for Boonle, a design marketplace for students launched in 2015, I thought that running a startup wouldn't be that difficult. I mean, come on, a quick browse through TechCrunch and you'll see companies that are pulling in multi-million dollar funding rounds and highlights of billion dollar valuations. I've got it! I'll build out the idea I have, raise a bunch of money, and get an article posted on all of the giant tech blogs. Acquisition in the millions is on the horizon. Retirement by 35... just as I planned. Now that I've been in the game for a couple of years, my past thoughts are beyond laughable. Truth is, many soon-to-be founders have this same mentality, both on raising money and launching a successful product. Have I raised a bunch of money? Nope. Had a successful exit? Nope. But I have gone through the process of getting started and there are things that I wish I knew then that I can now talk about with others. Please don't build it and assume they will come. Here's the reality of getting started. You need to build something that matters. You often hear people say "follow your passion" and you'll never work a day in your life. Yes, it's certainly better to do work that you love vs work that you hate. But if your passion is to make snow angels in the sand, you most likely don't have a business model. And without a business model, you don't make money. Last time I checked, businesses need to make money to survive. The flip side is hearing "solve a need" and business will flourish. This one is also partially true. Yes, solving a need will yield more revenue, but if you don't have the passion to go with it, chances are you won't make it in the business very long. That's why having a passion for what you're doing and solving a need is your ideal situation. Because starting a company is hard. Really hard. I've tried before and have failed. Less time with friends at the bar. So if you don't have passion to go along with your idea that solves a need, you won't be able to deal with the "hard" part of starting something new. Did you know? 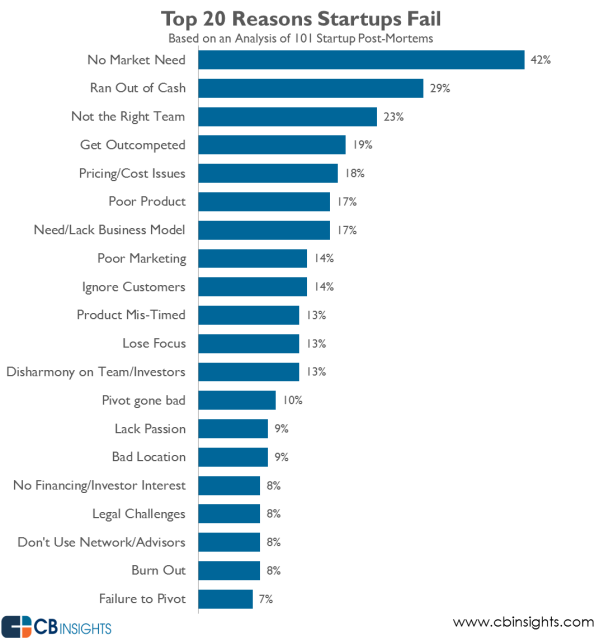 The majority of startups fail because there is no need in the market! How do you validate your startup idea? Start with the basics. This means doing various Google searches around the topic of your idea. How does your solution compare? What's the search traffic like? Are there recent articles published on the topic? Talk to people. Not just family and friends. They are biased and will most likely not provide you the feedback that you're looking for. Go to networking events and talk to potential customers about what you're doing. See what kind of interest there is. Better yet, will they buy it now before it's even built? Market research. If you're not sure where to start, reach out to your public library. They will often provide very expensive research data to you for free! What are the trends in the industry that you're entering? Is there room for you to enter and take a big piece of it ? By the way, no one ever wants to hear "if we just get 1% of the market...". Not sure what that is? Go and read The Lean Startup before doing anything else. Once you've done that, if you need help building your MVP, source freelancers to help you with the skills that you lack. There are countless platforms out there to hire writers, developers, and designers on the cheap. Test. And test some more. Now that you have your MVP done, you need to test it out. Go out and get users or customers for whatever it is that you're selling. Then, get feedback. You need real feedback from real customers to identify real problems. Trust me, you won't have it all figured out with your MVP. Analyze feedback, research more, and make changes that you feel are necessary to improve the product or service that you're offering. Repeat until you hit the sweet spot, often referred to as product-market fit. You'll eventually look back and say, "wow, that first iteration was crap." But you'll be a lot further ahead than if you went with the build it and they will come mentality.